The link on the right will take you to the download page on payloadz. The Seance Orb, is a modest $5.99. This is a one-time fee. There are no in-game fees or charges. WILLIAM BLAKE -- Blake holds the secrets to the Universe in the form of mental images that can be transferred from party to party. Only thing is, where's the party??? William Blake was misunderstood during his lifetime and, even now, as an acknowledged genius of art and poetry, his Vision is oft relegated to the bookshelf when it belongs within the HEART! 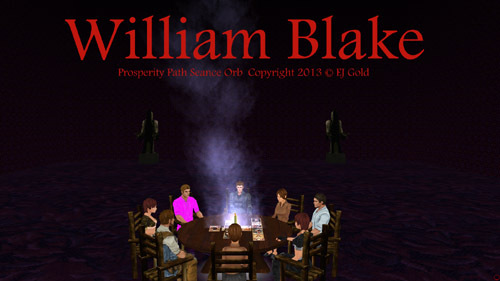 The William Blake Seance Orb is a unique opportunity to connect -- on the Quantum Level -- to this Great Soul and True Master of the Divine Imagination. It is highly recommended that Runners of this Orb be acquainted with Orbology as an Art. Success with the Orb "Karma Burn" is crucial to work with this unique Orb. Contact with William Blake should not be taken lightly. This Orb was generated by an agreement with Bodhisattva Blake and the T.U.I. (Terrestrial Urthgame Institute). William Blake is not a toy or puppet to be called up according to curiosity or whim. Upon sloughing of the mortal coil, Blake entered the Mystic Sun he spoke of, that company of Angels crying "Holy -- Holy -- Holy is the Lord God Almighty!" Running this virtual meditation, we may expect to connect with one of these Angels. As a young man, William Blake was in contact with his deceased Brother, Robert. He felt that Robert guided him "from Beyond" into the development of his unique method of printmaking. Years later, Blake would produce a drawing of the extraterrestrial being who "taught him painting." It should come as no surprise that Blake would "pay it forward" with spiritualistic contact via this Urthgame Orb. This is an Orb which turns timidity into a tremendous force of creative power. Obstacles no longer intimate and one is driven along the Path of Vision. When Blake wrote of the "Tyger Burning Bright," he may very well have been writing of YOU! If in doubt, ASK HIM!